The femoral stem is the portion of the replacement that fits into your thigh bone. Historically, this is made from cobalt-chromium and/or titanium metals. In the modern era of hip replacements, cemented stems (inserted with an epoxy bone cement) are composed of cobalt-chromium metals. Cementless stems (implants in which your bone grows into the metal) are routinely made of titanium. Both designs have had excellent long-term results as part of total hip replacement systems. Both titanium and cobalt-chromium implants are considered highly biocompatible—meaning they are generally well tolerated by the human body with low risk of adverse reaction. In fact, both materials have been shown to be highly effective in adhering to bone. The top end of the femoral stem (called the trunnion) is specially shaped to hold the new ball of the artificial joint. Regardless of the material that the ball is made out of, this is where the head and stem fit together. The acetabulum (cup) structure fits into your pelvis and is also made from various metals. The majority of modern cups are made from titanium or tantalum metals. Both metals are well tolerated by human bone and serve as excellent surfaces for bony attachment. The metallic cups serve to hold the liner of the hip replacement, which essentially serves as a replacement for cartilage. In rare cases, the plastic liner may be used without a metallic cup and is held in place using an epoxy bone cement. Ceramic—Many refer to this as a porcelain type material. This is a very hard surface and is extremely resistant to scratching or other damage. Ceramic heads can be paired with either ceramic or plastic liners. Cobalt-chromium—For the better part of the last three decades, this has been the most common material used for the ball as it is relatively-scratch resistant and holds up well (similar to ceramic described above). Cobalt-chromium heads can be paired with plastic or metal liners. Due to some potential concerns for metal debris formation when cobalt-chromium heads are paired with metal liners recently brought to light, cobalt-chromium heads are now most commonly used with plastic liners instead of metal liners. The acetabular liner fits into the cup and serves as your new cartilage. Much like the cartilage in your own hip, it is susceptible to wear and historically this has been the “weak link” of total hip replacement. Early forms of the liner were subject to wear by making contact with the ball and were thought to last only about 10 years. Modern day improvements have made liners last longer by either using alternative materials or strengthening the plastic. Ceramic—As mentioned above, ceramic is a very strong material and provides low wear rates when coupled with a ceramic ball (“ceramic-on-ceramic”). 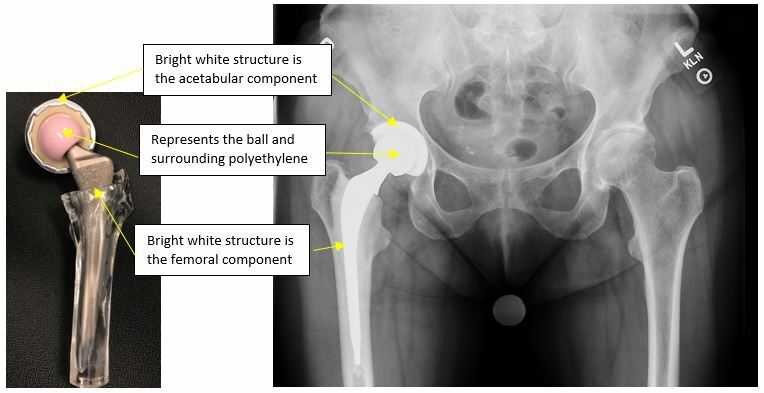 Cobalt-chromium—Metal liners have fallen out of favor when used with metal balls over the last 10 years; however, newer options where a plastic ball is placed in a metal liner (known as dual mobility) have shown excellent short-term results in the United States and may be useful when utilized in specific patients. 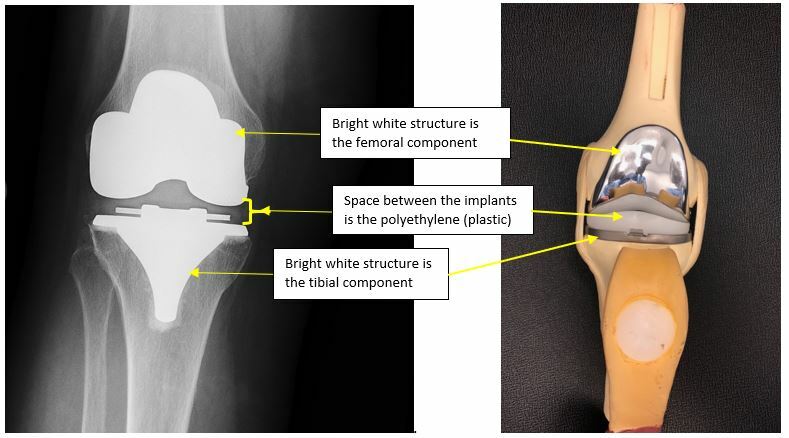 Polyethylene—Plastic is by far the most common material used for hip replacement liners. This material has provided good to excellent results when paired with ceramic or cobalt-chromium balls. Recent advances in the manufacturing of polyethylene have significantly improved the wear rates of these plastic liners over the last 10-15 years. When it comes time for a total hip replacement, you should discuss with your surgeon the options and pros and cons of each material. Together you can make the best decision for your particular case. While no surgical procedure is risk free or guarantees 100% success rates; remember total hip replacement is one of the most successful procedures in all of orthopedics. Many studies have shown hip implants can last beyond 15 years from the original surgery. Patella (kneecap)—this is an optional part of the surgery, and some physicians do not use this as part of the procedure. Typically made from cobalt-chromium as this material is scratch resistant and safe for use in total knee replacements. The majority of total knee femoral components are made out of cobalt-chromium with excellent long-term success rates. Titanium is often too soft (scratches easily) to be a femoral component in the knee, and ceramics have a much smaller role in procedures done in the United States. Made from either titanium or cobalt-chromium with excellent results for each. This portion of the replacement is meant to hold the plastic liner. Some tibial components are made of all plastic. This essentially is your new cartilage and fills the space between the two metal pieces. As with the total hip replacement, this is the “weak link” and is what will possibly wear out with time. If your surgeon elects to use this, the undersurface of the patella (knee cap) can be covered with a piece of a plastic. This is optional, and not all surgeons routinely use this implant. The success rate for total knee replacement is outstanding with modern implants being expected to last between 15-20 years. Similar to hip replacement, total knee replacement has been amongst the most successful orthopaedic surgeries in restoring function and quality of life. Total knee replacements have become incredibly popular in the last two decades rising at greater rates than hips (nearly a 2:1 ratio). The basic materials are the same for both hip and knee replacements, although ceramics are not routinely utilized in knee implant materials in the United States. As we continue to pursue perfect hip and knee replacements, there are likely to be some designs and materials that perform better than others. The bulk materials used to make hip and knee replacements are quite similar and have not changed drastically in the last 30 years. Reaction and complications directly related to the materials themselves, while possible, are not common as manufacturer guidelines and standards are strictly followed and monitored. The majority of total hip and knee patients can anticipate long-term success somewhere between 80-85% at 10-15 years after the surgery. Despite recent concerns for the metals and materials used in hip and knee replacement, the vast majority of these procedures lead to successful outcomes with improvement in patients’ quality of life and function. AAHKS recommends discussing implant options with your surgeon to gain an understanding of the particular materials to be used in your surgery. Discuss with your surgeon the risks and benefits of different implants and materials to gain an understanding of the proposed procedure. Developing a good relationship and level of trust with your surgeon is a key aspect of ensuring a successful outcome. In the end, your surgeon is looking out for your best interests, and as much as you trust an airline pilot and the flight plan they follow, you should have the same trust in your surgeon. What is the chance of my body “rejecting” the implant? Unlike an organ transplant, the risk of your body rejecting the artificial hip or knee parts is exceedingly rare. The materials used in the typical replacement surgery are well tolerated by the body and have a long track record of successful implantation. While in rare cases the parts may become loose or infected, this is typically related to other factors and not due to your body “rejecting” the parts. How do I know if I have a recalled implant? I have a history of nickel allergy and/or break out in a rash with certain types of jewelry. How do I know if I am allergic to the implants? How do I know if I have developed metal poisoning from the replacement parts? Can I have a hip or knee replacement if I am allergic to metal?